1 September: Katie Bell, Cormac McLaggen, Cho Chang and Marietta Edgecombe begin attending Hogwarts School of Witchcraft and Wizardry and are sorted into Gryffindor and Ravenclaw, respectively. Cornelius Fudge becomes Minister for Magic. The 421st Quidditch World Cup is held. After a five-day-long final, Canada defeats Scotland. In a post-match interview, Scottish Seeker Hector Lamont famously blames his father, "Stubby" Lamont, for not giving him longer fingers. 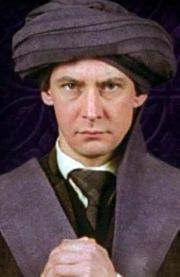 Charity Burbage becomes the new Muggle Studies Professor after Quirinus Quirrell quits. Pollux Black, grandfather of Sirius Black III, dies. Mrs. Lovegood, Luna Lovegood's mother, dies in a freak-accident. 13 February: Tom Moorcroft, who portrayed Regulus Black, is born. 28 February: Georgina Leonidas, who plays Gryffindor student Katie Bell, is born. 15 April: Actress Emma Watson, who portrays Hermione Granger in the Harry Potter films, is born to Jaqueline Luesby and Chris Watson. 6 October: Actress Scarlett Byrne, who portrays Pansy Parkinson in the film version of Harry Potter and the Half-Blood Prince, is born. ↑ Pottermore - New from J.K. Rowling: "Quidditch World Cup (1990-2014)"
This text is available under the GNU FDL and may have been adapted from the Wikipedia article about 1990 (history).